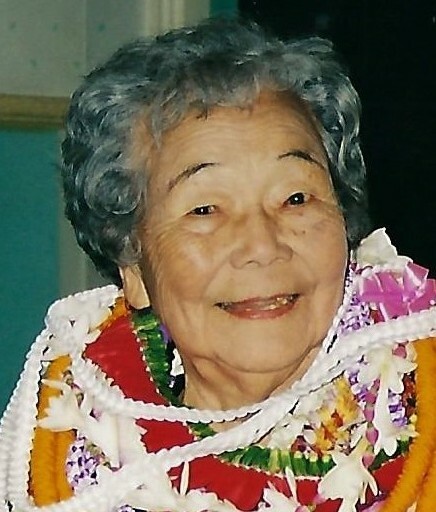 KATHERINE MICHIYO NAKAMURA 103 years, of Honolulu, Hawaii, passed away peacefully on February 6, 2017, surrounded by family. She was born on November 19, 1913 and grew up on a farm in Kaneohe, the oldest of four children. She left school after the required eighth grade to help with the family's income. Katherine was sent to live with a barber and his family, supposedly to apprentice the trade. But for years she instead worked as their maid, babysitting, cleaning, washing diapers, etc. Eventually, Katherine learned the skills and became a barber. Katherine's first job was in a shop on Beretania Street where she worked before buying the business and operating it until the building was torn down. She then moved to Liliha Street and opened Kay's Barbershop where she remained for 35 years. Katherine finally retired at the age of 86 on December 31, 1999, bidding aloha to her many loyal customers. As an active member of the Liliha Businessmen Association, she was presented with a congratulatory certificate by the State Senate upon her retirement. Katherine enjoyed her retirement fully until the final days of her passing. She remained active physically and mentally, honing her skills at crocheting, patchwork, needlework and many other crafts. Katherine loved her exercise classes, and also attending Day Care, thriving in the loving and supportive program at the Sakura House where she created many beautiful craft projects as well as enjoying the fellowship of friends. Till the very end, Katherine loved to play Hanafuda and Bingo where she was very skillful and also seemed to be unusually lucky, winning most of the games. Katherine found much joy in her eight grandchildren and ten great grandchildren. She is preceded in death by husband James I. Nakamura and son Bert M. Nakamura. Katherine is survived by daughters Jean (Katsuo) Yamashiro, Jane (Norman) Kobayashi, and son George (Amy) Nakamura. She has one surviving sister, Jenny Fujioka. Private services were held at the Higashi Hongwanji Mission of Hawaii with inurnment at the Japanese Memorial Cemetery in Moiliili. No "koden", monetary offerings.